Susan B. 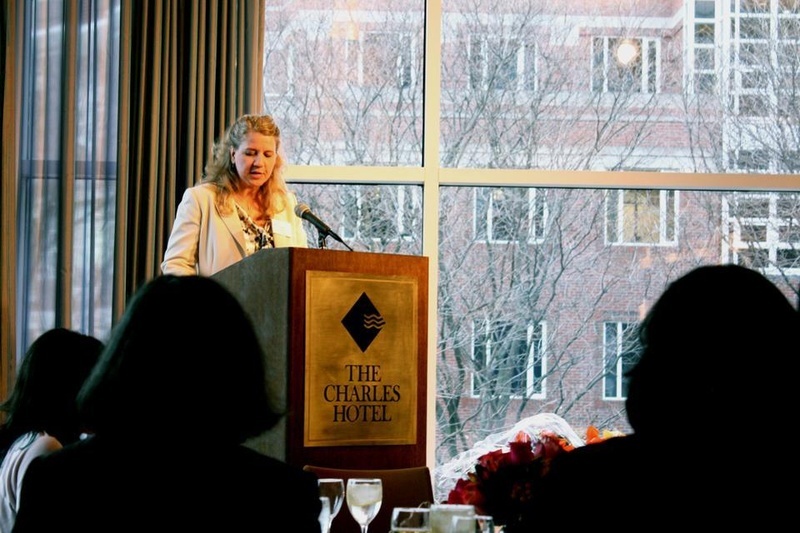 Marine, GSE ‘04, director of the Harvard College Women’s Center, speaks about leadership at a ceremony celebrating undergraduate women leaders of the senior class yesterday. The extravagant Regatta Bar in the Charles Hotel buzzed with the conversations of Harvard community members, united to honor the recipients and nominees of the 14th annual Harvard College Leadership Awards yesterday. Madeleine E. Ballard ’11, a director of the Peer Health Exchange and Radcliffe rugby player, was honored as the award recipient. An honorable mention was presented to Emily K. Harburg ’11, a former co-vice president in the Leadership Institute at Harvard College and a former member of the varsity women’s volleyball team. The Women’s Leadership Award was the brainchild of Terrie Fried Bloom ’75, who sought to amplify visibility of women leaders at Harvard College. She said former Harvard College Dean Harry R. Lewis ’68 helped her develop the idea to honor student-leaders who have empowered and inspired women to assume leadership roles. “There were bad feelings between Harvard and Radcliffe, and this award was a way to give an olive branch,” said Bloom, who funded the award through an endowment established with a gift. “Their personal integrity and selfless leadership is what the College is committed to instilling in its students. They inspire us to make positive contributions in the world,” Hammonds said. After the students were honored, Christina “Tina” M. Tchen ’78, assistant to the President and Chief of Staff to First Lady Michelle Obama, was named the recipient of the Women’s Professional Leadership Award. This award, given to a Radcliffe College or Harvard College alumnus, acknowledged Tchen for her achievements in public service. She was recognized for her work as former director of the Office of Public Engagement and current executive director of the White House Council on Women and Girls. Ballard said that she hopes people leave the event with a new definition of leadership. —Staff writer Nadia L. Farjood can be reached at nadiafarjood@college.harvard.edu.